Everyone has been talking about Disney+, the Mouse House’s new attempt to enter the streaming content market in a big way — looking to take on Netflix, Hulu, and all the rest. Well now Animation World Network has let us know about about a new animated series for Disney+ with a very familiar furry angle. 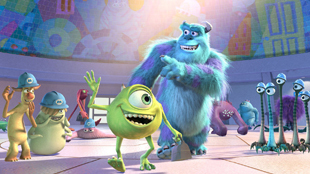 “Billy Crystal and John Goodman will reprise their beloved roles as Mike and Sulley in Monsters At Work, a new animated series for families set to premiere on Disney+ in 2020. Produced by Disney Television Animation and inspired by the world of Disney and Pixar’s Academy Award-winning Monsters, Inc., the series picks up six months after the original movie’s story, with the Monsters, Inc. power plant now harvesting the laughter of children to fuel the city of Monstropolis, thanks to Mike and Sulley’s discovery that laughter generates ten times more energy than screams. Monsters At Work follows Tylor Tuskmon (voiced by Ben Feldman), an eager and talented young mechanic on the Monsters, Inc. Facilities Team (MIFT) who dreams of working his way up to the factory Laugh Floor to become a Jokester alongside his idols Mike and Sulley.” As the article points out, the voice cast includes a lot more familiar and talented names too.